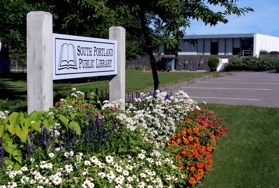 The City of South Portland is proposing a $5,000 cut to the "collections" budget at the public library. Now, I understand that it's not the only city department facing cuts, but the cost/benefit ratio of keeping our library current is HUGE. South Portland is a great community because we pull together and benefit together as a community. I don't have a swimming pool, but my son is learning to be a great swimmer because we have an indoor community pool. We have wonderful parks, the rec center, athletic fields, a municipal golf course. We share these because we've decided we'd rather own these as a community than close them off to all but the well-heeled members of a country club. The high school theater program runs into a snag with the publicity policy for Thoroughly Modern Millie so we pull together and post about it. On signs, on local media, on social media, with emails to friends and neighbors. Our city hasn't had to institute a "per bag" charge for garbage pickup because we have a single-sort curbside recycling service, and voluntary participation is keeping costs down for trash service. We made the decision to invest in our future by making quality expansion and improvements to our public high school. Here's something fun. Try calculating the value of your usage of the library. It will surprise you. Those items will be used – on average – at least 20 times, so nearly 7,000 actual, individual, direct uses of the material. Those 7,000 uses have a retail value of $119,000. A $5,000 investment in the library RETURNS $119,000 in tangible value to the community. Full disclosure: I am a member of the Library Advisory Board, but my service is purely voluntary and I have nothing to gain, financially or otherwise, by telling you about this (trust me, I don't get first dibs on the new books, I don't get a free coffee at the meeting, and I pay my overdue fines just like everyone else). I'm not bringing news of this budget cut to you because of that. I only know about it because of the Board. And I want you to know about it too. but 83rd in per capita spending. We believe in investing in our schools, and to me, investing in the library is a continuation of school. The library is a "cradle to grave service." Children need to be read to, but they also need to see their parents reading. Reading isn't an activity that should stop when you get a diploma. Anyone involved in literacy will tell you that children observing their parents reading regularly is foundational to encouraging children to read. I can't begin to tell you how many new things I have wanted to learn, and have learned, because I found the answers in books. Yesterday I was wearing a sweater that I knitted. A colleague admired it and then sighed, "I could never do that." I replied, "Yes, you could! Yes you can! A non-runner doesn't run a marathon on their first day of training! It's the same thing." Only a little tiny bit of what I know about knitting I've learned from "being taught." The great majority I've learned because of excellent knitting books, many of which I've borrowed from the library. I don't need to own them.... I just need to borrow them. Two words: parenting books. I don't want to buy these, because most of the time, I'm nearly past the problem by the time I've read enough about it to understand or solve it. I've recently become interested in traditional food preservation (much more on this at another time) but suffice to say, I've started my journey down this path with, you guessed it, library books. Don't believe for one tiny moment that the answer here is "e-books." NOT TRUE. First, e-books require an expensive device, nullifying the egalitarianism of the library. No device, or no electricity for the device, means no access to books. Furthermore, "publishers" of e-books set LIMITS on how many times an e-book may be loaned by a library, a limit far lower than the lifespan of a typical book. An e-book is usually loanable 25 times per license, whereas a hardcover book can be borrowed by 80-100 patrons before it wears out (and countless more readers might flip through it at the library without formally checking it out). If you own an e-reader, and you love it, great! But that's not the proper model for the public library when the codex has 1,500 years of proven success. We CAN afford to continue to invest properly in our library. Frankly, we can't afford NOT to. Bravo, Aimee. You get it and I hope that the rest of your community will, too. Thank you! Pat, Wil. Wil, Pat! Now we're all friends!